Revisiting The MCU: THOR | Warped Factor - Words in the Key of Geek. As we continue our look back at the movies from the Marvel Cinematic Universe, Da'Mon Guy revisits Thor. The Hollywood love affair with superheroes and comics was in full swing by the debut of 2011’s Thor, the second of the films to be released in the effort to make all of the Avengers relevant and ready for the big screen debut. 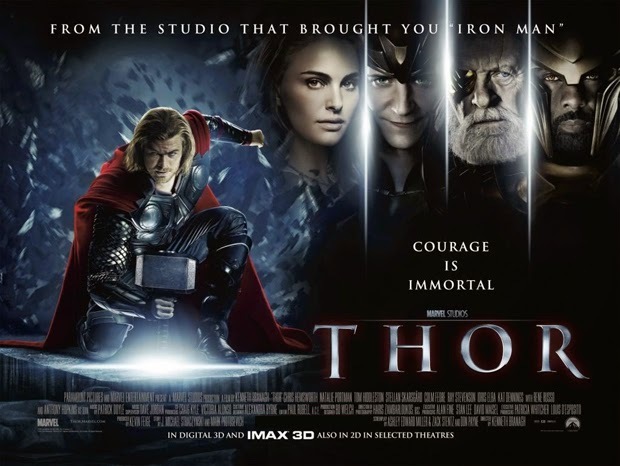 Thor was an entertaining addition to the ongoing surge in movies adapted from the pages of Marvel Comics, and one which was highlighted by an outstanding performance by Chris Hemsworth, andh strong support from Natalie Portman, Anthony Hopkins, Tom Hiddleston, Kat Dennings, and Stellan Skarsgard. It also features Idris Elba, Ray Stevenson, Renee Russo, Jamie Alexander, and Clark Gregg. The character of Thor is one of the longest tenured characters created by Marvel Comics, however, among non-comic book readers he is also one of its lesser known characters. The Asgardian God of Thunder debuted in the science fiction/fantasy anthology title Journey Into Mystery #83 (cover-date Aug. 1962), created by editor-plotter Stan Lee, scripter Larry Lieber, and penciller Jack Kirby, so although he had been around almost 50 years this movie marked the first attempt to bring the character to the big screen (discounting a brief appearance in a made for TV movie with the Incredible Hulk back in the 1990’s). Thor is a visual extravaganza filled with tremendous special effects that highlight a mediocre origin story. The cinematography and most of the special effects are done extremely well, with the exception of a few which look a little cartoonish, but they help to enhance the nature of the movie. The film is actually two stories merged into one to try to establish a human element to the larger than life character. It has a fantasy/sci-fi element that showcases the God of Thunder in his true element as the heir to the throne of Asgard. This was one of the best parts, where we see Thor’s power and his warrior-like ways. In addition, the special effects and cinematography are great as they are incorporated into the story to visually bring the other realm to life. The second sub-story of Thor is his tale after he is cast out by Odin. This part of the movie is the backbone of the film as Hemsworth really displays the human side to the character and opens the door for more of the humorous aspect of the story. As Thor struggles to fit into the modern world, the audience is amusingly entertained by the conflicted ways of modern times as opposed to Thor’s Viking-like approach to life. The film wasn’t all true to the original character of Thor, as this incarnation of Marvel's God of Thunder more resembles the edition that was used in the comics and the animated feature entitled "Ultimate Avengers." However, Chris Hemsworth does an excellent job as the son of Odin, he nails the character perfectly, almost as if he were born to play it. Hemsworth’s portrayal of Thor is as impressive as any actor to transition a character to the big screen. Hopkins was also impressive as Odin, adding a nice performance as the “All Father”. Kat Dennings (Darcy Lewis) has a number of witty lines that add humor and increase the enjoyment of the film. The other actors in the film were less than spectacular. Natalie Portman, for example, is a far better actress than what she presents within Thor. The main detractor with Thor is that there’s no villainous performance to offset Hemsworth’s great portrayal of the title character, and any comic book movie is only as great as the villain that opposes the hero. All of the great movies have them (The Dark Knight, Spider-man, Superman), no matter how great the hero is, there has to be an equal or greater performance by the villain. Thor just didn’t have that. Loki is Thor’s quintessential arch-nemesis, but Tom Hiddleston wasn’t very comfortable with the role of Thor’s half brother at this point in time, he was nowhere near what he has become after three movies with the character, and so was a bit of a disappointment. Here, in his debut, he's just not as malevolent or devious as he should’ve been, and this was one of the reasons that the film didn’t hit the upper echelon reached by other great comic book movies. The second detractor is a common one leveled at many of Marvel's attempts to transition its characters to the big screen - the climax of the movie. Thor’s climax doesn't compliment the film in the way that it should, it doesn't contain that great climax that makes us want to cheer at the end. Instead, it tries to piece together some huge finale that doesn't equate to the character. The problem whenever a movie debuts is that it will be compared to others in its genre, and with the recent abundance of superhero/comic book inspired movies, Thor has a lot of really great comic book movies to be measured against. You're left feeling that Thor was a good movie, but not a great film, nor would I have considered it a blockbuster in the same way as Iron Man was prior to this. It just didn’t contain that attention grabbing effect. Now, when we look back at the blueprint Marvel used to set up the Avengers and the Marvel Cinematic Universe it was ingenious. Looking back on Thor now, it still was not as good as it should have been, but as the second step in the creation of the Avengers, it was a great one. It helped to make Thor relevant again and turned Hemsworth into a bonafide star.